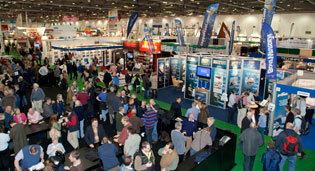 The Tullett Prebon London Boat Show drew to a close yesterday after attracting 93,327 visitors to the ExCeL Exhibition Centre. This is down on 2012’s attendance – 102,841 – but the 2013 edition was a day shorter and hit by bad weather in the closing stages. In fact, until Thursday attendance was running 1% ahead of 2012. These figures do not include those people who came for the London Bike, Outdoor and Active Travel shows, which ran over the last four days of the show, and which will push overall attendance even higher. In announcing these figures, organiser National Boat Shows (NBS) also put to bed suggestions the show would be cancelled next year by releasing show dates for 2014, 2015 and 2016. Murray Ellis, MD NBS, said: “We are pleased with how well the changes to the 2013 show have been received and that there has been a real benefit to many of the exhibitors and visitors.